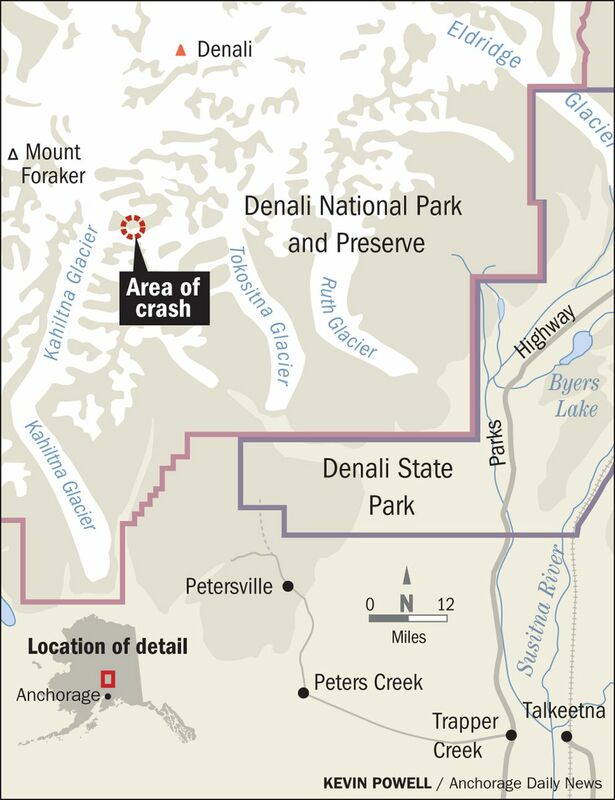 TALKEETNA — Five people are believed to have died in Saturday's crash of a flightseeing plane near Denali, the deadliest crash of an air taxi in the Alaska Range in decades. A National Park Service ranger found four bodies in the wreckage during a search made brief by weather Monday at the precarious site. A fifth person aboard the K2 Aviation de Havilland Beaver was not found but is presumed dead, authorities say. The wreckage was located almost 11,000 feet up a remote mountain near North America's tallest peak, and came to rest perched on a steep glacier. Word that no one survived Saturday's crash dashed hopes that the occupants might be alive. The plane's pilot survived the crash, and made contact twice before communications ended. K2 announced Monday it is suspending flightseeing tours until further notice "as we give our staff time to grieve this loss." The park service on Monday afternoon identified the pilot as Craig Layson of Saline, Michigan. The Saline Post newspaper said Monday that Layson and his wife had spent the past two summers in Alaska. The passengers are from Poland but their names have not been released. The park service is in contact with the Polish Consulate in Los Angeles. The trip was booked through a tour company in Poland, according to park service spokeswoman Katherine Belcher. Layson was able to make two calls by satellite phone in the hour after the crash and reported injuries before communication with the plane ended. It wasn't immediately clear how many people survived the initial crash. The plane was equipped with an emergency survival kit, including sleeping bags, a stove and pot to boil water, food and a first-aid kit. 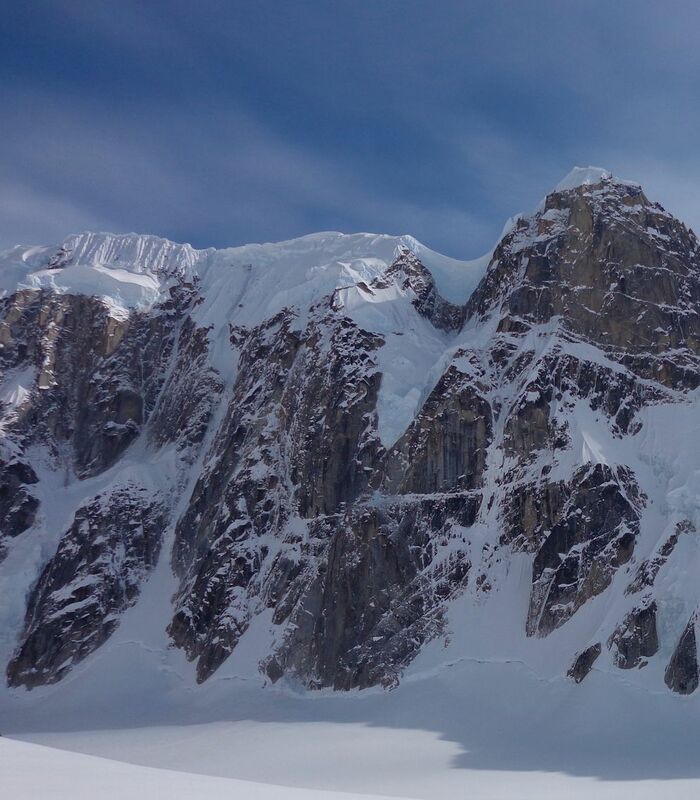 The plane crashed near the summit of what's known locally as Thunder Mountain, a feature roughly 14 miles southwest of the summit of Denali in extremely technical terrain on a hanging glacier. Rescuers took advantage of a brief window of clearing weather Monday morning to spot the wreckage for the first time since the plane went down at about 6 p.m. Saturday. Then a ranger was lowered to the scene. The ranger who got to the plane Monday said it appeared highly unlikely people had moved around after the crash. The plane crashed in steep terrain in a crevasse on the side of a mountain, according to Chris Erickson, the climbing ranger who confirmed that none of people in the plane survived. It was windy and the temperature was about freezing, maybe just below. 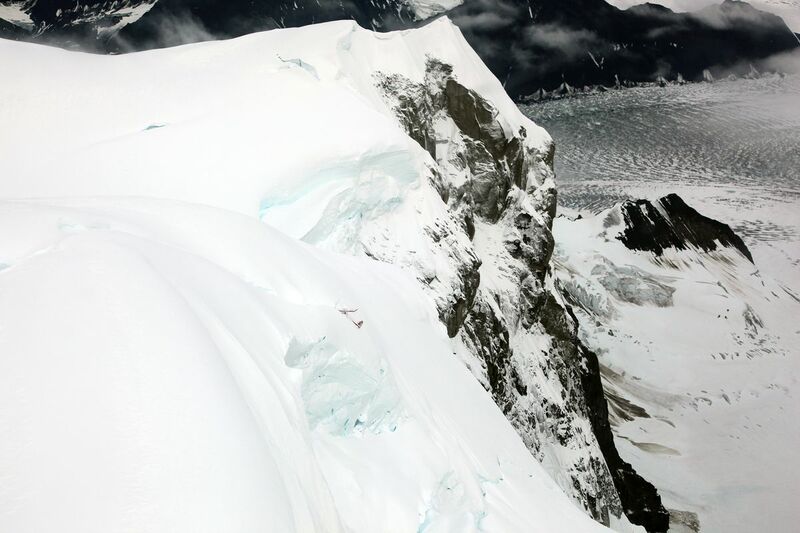 Erickson, wearing a climbing harness, hung from a fixed rope attached to a helicopter and stood on top of the plane, which was "unstable" and in a depression in the crevasse. The search lasted less than 5 minutes because clouds were moving in again quickly. 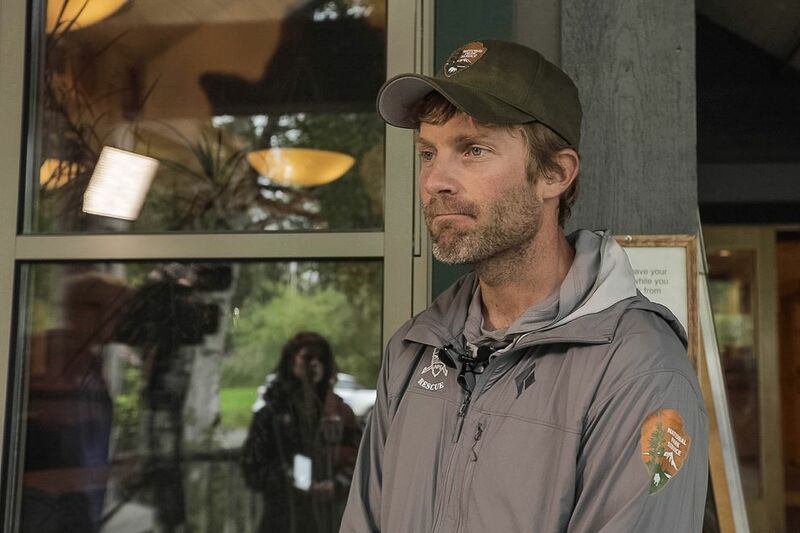 A couple of inches of snow covered the contents of the plane, Erickson said as he described the mission at the Talkeetna ranger station Monday afternoon. More looked like it had drifted in. He found the bodies of four of the five people and detected no signs of life, Erickson said. It's possible the fifth was inside but he just couldn't see that person because the incoming weather limited his time in the nose of the aircraft. No footprints or disturbances led away from the site and there were no other signs to indicate any of the occupants made it out of the plane, officials said. The weather closed back in, making additional efforts to find the fifth person impossible for now, Belcher said. The National Transportation Safety Board is assigning two investigators to look into the crash "because of the issues here," said Clint Johnson, the agency's Alaska chief. The investigators will head to Talkeetna from Anchorage in the next few days, Johnson said. "Whether we're going to the site or not, that's to be determined," he said. "This apparently is in a very, very precarious location." K2 is working with all responding agencies to cooperate fully with the investigation, the company said in a statement emailed by public relations firm Thompson & Co. The company, family owned and operated for 55 years, is owned by Suzanne and Todd Rust. "The first responders from the National Park Service, FAA, NTSB, and Alaska Air National Guard have our utmost thanks and appreciation for their tireless efforts," the company statement said. "It is imperative we understand the factors surrounding this incident to help prevent any further tragedies. We would also like to thank the community of Talkeetna and our tour partners across the state for its support in the recent days." The ridge where the plane crashed was described by searchers as "a mix of near-vertical rock, ice and snow." A park service helicopter launched two hours after the crash and got within a mile of the plane's GPS coordinates broadcast by an emergency transponder but couldn't spot the wreckage or make radio contact, officials said. An Air National Guard helicopter and two K2 planes flew the area Saturday night but also couldn't see anything or communicate with the downed plane. The search resumed Sunday at about 5 a.m. but a heavy cloud cover blocked efforts to find the plane and the search was suspended again. The National Park Service high-altitude helicopter, along with an Air National Guard C-130 and two HH-60 Pave Hawk helicopters, departed early Monday morning. The plane was found a little over 36 hours after it crashed. 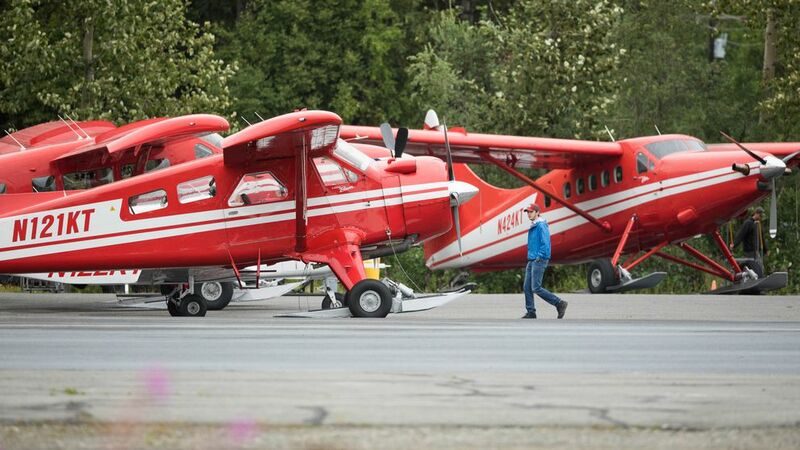 It's been years since a Denali air taxi company experienced a fatal crash in the Alaska Range. Pilot Keli Mahoney and three passengers died in May 2003 when the Cessna 185 she flew crashed at the 8,200-foot level of South Hunter Pass. Well-known pilot and dog musher Don Bowers died, along with three rangers, in a 2000 crash along the Yentna Glacier after Bowers reported a wall of clouds blocking his normal route to Talkeetna. In 1981, a flight crashed on the mountain and all aboard survived — initially. A Cessna 185 operated by Hudson's Air Service crashed at 10,300 feet in Kahiltna Pass on Denali. Pilot Ed Hommer and three passengers — Hommer's brother-in-law Dan Hartmann and tourists Patrick Scanlon and Mike Clouser — all survived the initial crash, though Hartmann and Scanlon ultimately died on the mountain. Rescuers didn't reach them for four days and nights. Clouser and Scanlon's estate won a federal court case against the United States, asserting negligence in the rescue effort to retrieve them from the mountain. Devin Kelly reported from Talkeetna and Zaz Hollander from Wasilla. Correction: A previous version of this story incorrectly reported the first name of the climbing ranger who was lowered to the crash site. His name is Chris Erickson.